Reprinted in The Greatest Superman Stories Ever Told and Superman in the Seventies, both of which are available at our online bookshop. "When I was about 20 and starting to write Superman I had made friends with a younger kid, young Jeph Loeb of whom you no doubt know. Jeph and I were apparently talking at some length one day about Superman, and Jeph seems to have come up with an idea called, 'Why Must There Be a Superman?' which he later wrote down and kept in a drawer somewhere. Meanwhile, weeks or months later, I had a plotting session with Julie Schwartz in which I threw out maybe half-a-dozen ideas the last of which was about Superman screwing up human social norms, a story which became 'Must There Be a Superman?' That was the idea Julie flipped over. He called in Denny O'Neil from out in the hall to kvell over it while I sat there. And then there was the story. "It was a story in which I articulated to myself a number of the questions that eventually I tried to answer with the Superman series: What was Superman's relationship to his charges, the people of the Earth? To the authoritative functionaries of the rest of the Universe like the Guardians and, by extension, those who might be considered deities? What were the limits of Superman's responsibilities? Were there differences between the real limits of his responsibilities and his perception of those responsibilities? What role did his heritage, both on Earth and among the stars, play in the determination of his actions? What long-term effects were coming about as a result of his intercession? And so forth. These were all questions I mulled over, most of which I dismissed for a time, in the course of writing that story. It was my first Superman story, and Julie Schwartz, Denny O'Neil, Neal Adams, Murphy Anderson, Carmine Infantino, and others made a point to me over and over -- as if they had rehearsed it together and all decided to impress me with it individually -- that it was the general belief that Superman was the hardest character to write. In fact, it took me about a month, maybe more, to write that one story. I believed them all for a while, but I eventually realized I was not really struggling particularly with Superman at all. I was exulting in writing this series. It took me awhile to notice this, but it was true. And I think I managed to deal with what the others found so difficult, simply because I had started out by posing to myself what I considered to be these fundamental questions. I think many of my subsequent stories addressed individually most of the questions this first story posed. "It wasn't until years later -- many years later, as it happens -- when I picked up a copy of the story off a rack in an LA comics shop where I had gone to see Jeph along with Tim Sale autographing copies of a comic book they had created and I had edited, that Jeph reminded me of the story's pedigree. I swear I didn't realize it at the time, don't remember it now, and I absolutely believe Jeph because he's a pal and wouldn't make something like that up. "Loose lips and all that. Beware our best intentions." "The script which I wrote called 'Why must there be a Superman?' was something I gave to Elliot -- who is still one of my heroes -- when I was around 12 or 13 years old. Something in there got stuck and a while later, Elliot wrote the story 'Must There Be A Superman?' 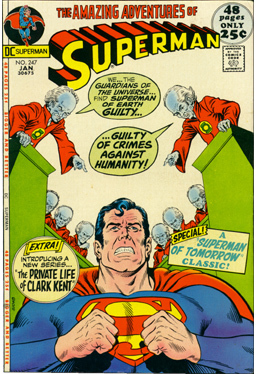 which, like my story, had the premise of The Guardians of the Universe questioning Superman's role on earth. Elliot's story was far superior, and I, admittedly, had copped the ending of my story from Spider-Man #100 -- which Elliot chided me for. It wasn't until many years later that he and I talked about the similarities in mine and his stories and he has apologized so many times in person and in print that it's embarrassing. The truth is that I was flattered that he liked anything that I had to write. He continues to be one of my inspirations."